Play the best video games in your rec room! All of your favories in stock! Speed and thrills in your home! Used pool tables for every price range. Classic arcade games for your rec room or basement! High-quality new and used billiards tables! Valley has taken the very best commercial pool table and made it even better. The new mahogany finish looks better and will attract more play in any establishment. Dramatic 45 degree angled corners and legs. The new signature look for Valley's classic pool tables. Each corner is triple plated--polished and buffed chrome on top of nickel and copper plating. 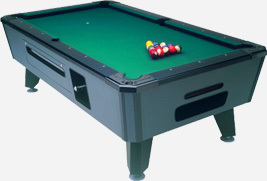 We offer a wide variety of new and pre-owned home and coin-operated pool tables. If you are looking for a specific make or model please contact us and we'll be glad to assist you.